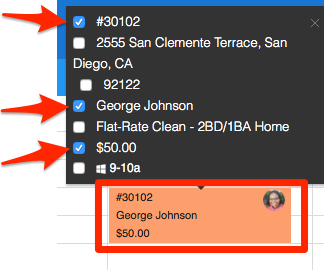 From the web portal (computer) you can choose 3 details to view from the calendar for a job; invoice #, service address, zip code, customer name, line item, line item cost, or arrival window. When you select the 3 you want to see they will appear on the calendar view for the job as you see below. All jobs will show the same checked information if that information is given. Note: You can check more than 3 details, however it will only show 3 pieces of info on the calendar view. To see further details, you would need to click into the job.